One of the blessings of posting a blog with worldwide readers is I get to make new friends from around the world. One such blessing, Karien duPlessis, came into my life recently and I just had to share her with the rest of you! She is from South Africa and a newly born Linen Lady. I can hardly believe that this is her FIRST one...I think she's addicted, don't you??? "I am from South Africa and live 2 hours drive from the closest city on a farm. Quilting is my passion, but unfortunately we live in a third world down here and it sometimes frustrates me waiting 3-6 weeks to receive ordered quilting stuff from the USA. Luckily we have good internet and I use it ultimately to see what other quilters do around the word. I did Cindy's online class with Craftsy and got some of her fantastic books. 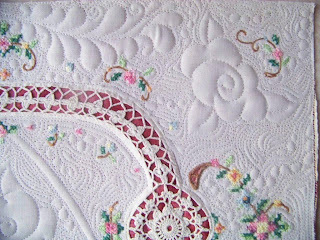 I got so inspired that I just have to quilt something that would go through as an heirloom-project. 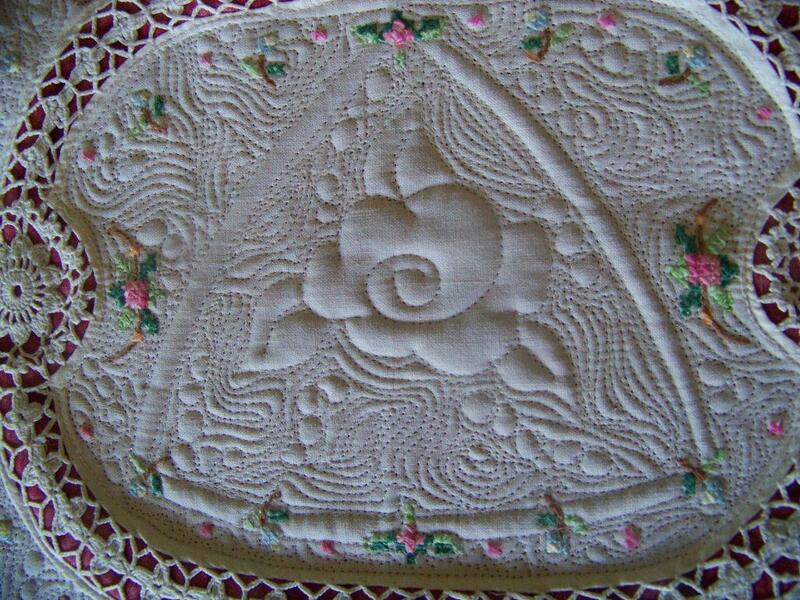 So, I got this old tray cloth from my mother-in-law, but couldn't use it because it didn't lie flat. It also had stains on it, but luckily my mother could fix that over Christmas. I tried to apply Cindy's advice about design. The only stencil that fit the space in the middle (to create focus) was the rose...so I used it LOL! To create movement I put other roses at the edge and added the little triangular 'border' around the middle rose. Maybe the shape was a mistake. The only dimension I could create was in that 'faulty' little border by putting it behind the little flowers. I'll work on adding dimension in other projects in the near future. To create light and shadow, I've tried my hand on Cindy's Pearls and Swirls background filler. I was surprised at the effect! 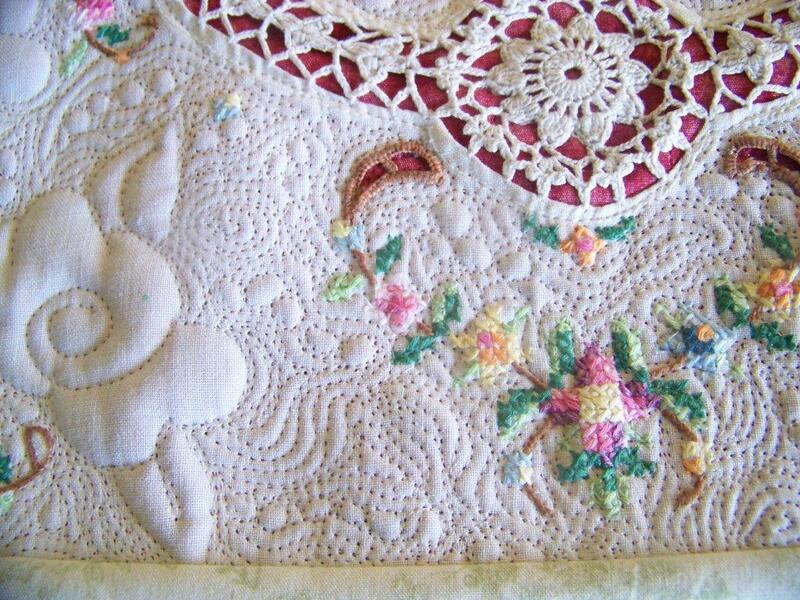 I stitched everywhere in the ditch, except the crochet border. 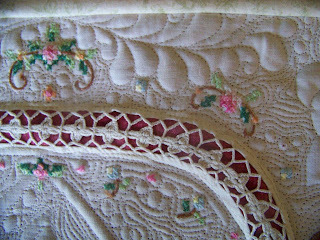 I only SID on it's edges and the two little flowers on the short sides of the crochet border. It really pops! 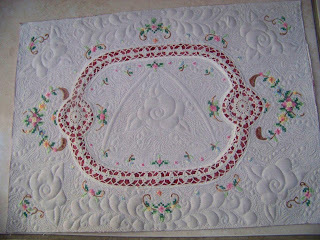 I am anxiously looking for other old stuff that my mother-in-law left that I could quilt. 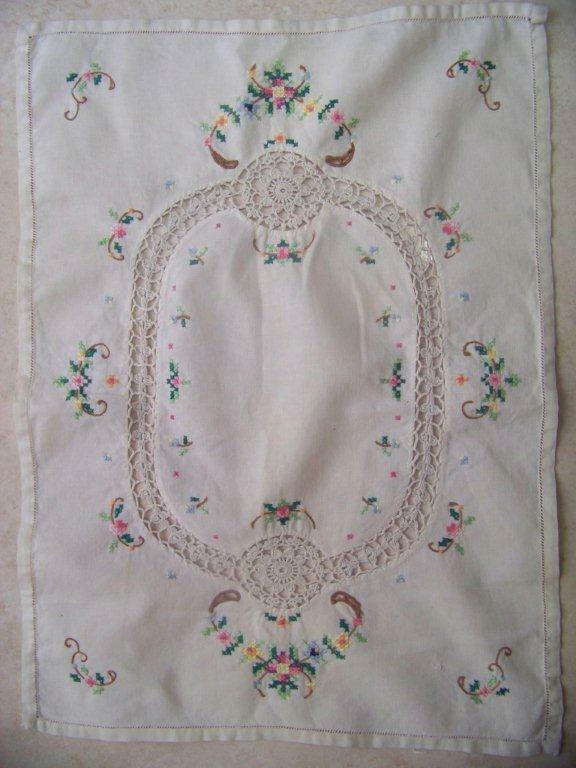 One of these days I am going to try my hand on an old embroidery tablecloth I've bought on Bid-or-Buy." That is so beautiful. I've pulled out some linens to tackle but still hesitant. I'm getting closer, however, to take the plunge. Karien's work is just beautiful! 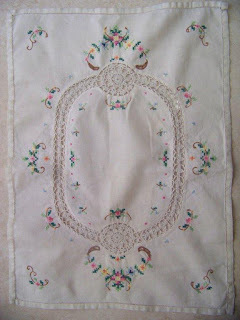 I have several vintage linens and I think I'm going to try to work on one of them soon. I learned a lot from sewcalgal's challenge and all the experts, so that I am a little braver than I used to be and can see some of the possibilities! What lovely work! Thank you for continuing to share your students' work with all of us! This is just stunning! Usually I am against altering old linens, but this makes them heirlooms in a way that they weren't before. Beautiful work. This is just lovely. 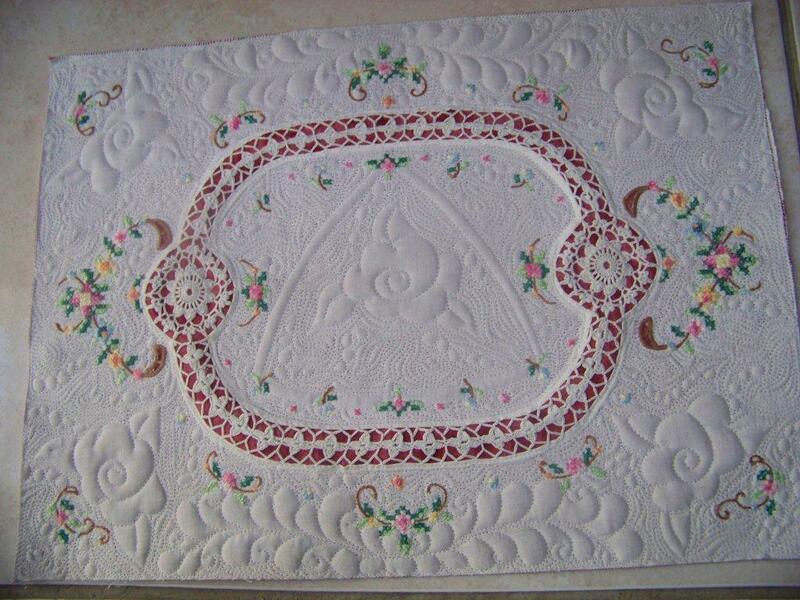 I love the way you make the tight quilting. And i agree with Diane - I think i am getting closer too. Welcome to the linen ladies Karien! Once you start you won't be able to stop and that's a good thing. Karien, this is gorgeous! 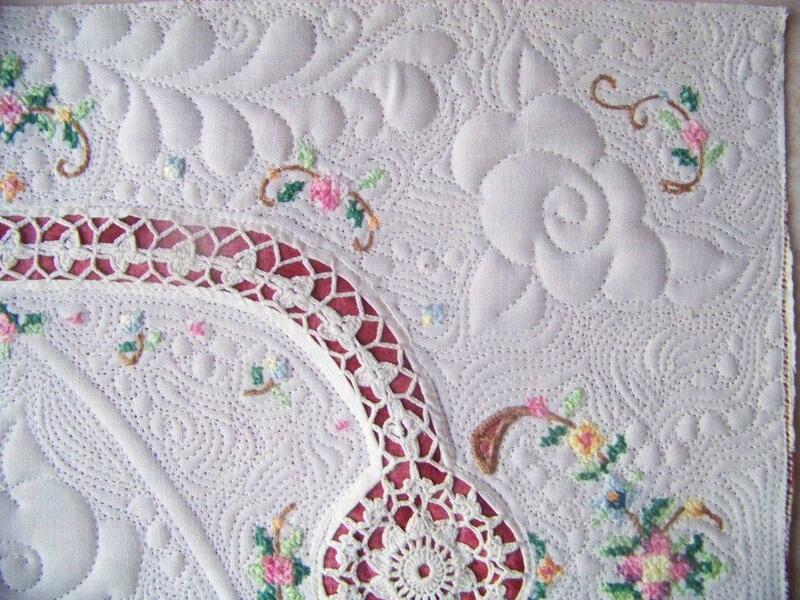 I'm always amazed how international the quilting community is!